Numerous oncogenic mutations occur within the BRAF kinase domain. While the majority of these mutations are activating mutations, kinase inactivating mutations in BRAF have also been reported to drive MAPK pathway signaling, suggesting that BRAF has both kinase activity dependent and independent functions. Similarly, genetic evidence suggests that CRAF may harbor both kinase dependent and independent functions that may be important in RAS-driven disease. In this presentation, I will discuss how kinase dependent and independent functions of RAF kinases regulate disease. 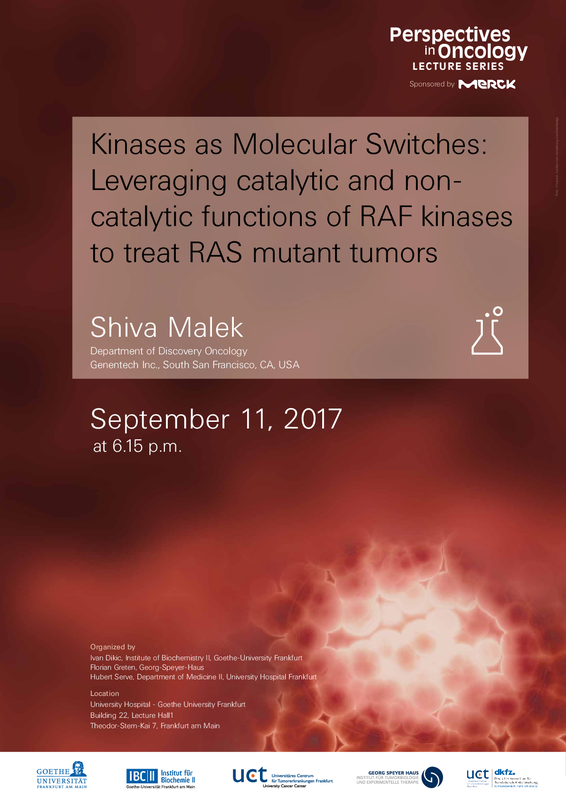 Further, I will highlight how we can utilize conformation-specific kinase inhibitors to modulate both catalytic and non-catalytic functions of kinases as a therapeutic approach. Please feel free to forward the enclosed poster announcement to colleagues, who might be interested as well. We look forward to welcoming you to the lecture and a small reception afterwards.